Miriam and Chris went to Dishdash and had mansaf, lamb in aged yogurt. They asked me to replicate this dish for Sunday dinner. This is originally a Bedouin dish that is claimed by the Jordanians as a national dish. One site even claimed that mansaf is what Abraham served the angels. The key ingredient in mansaf is the aged yogurt, jameed. This is yogurt that has had a lot of salt added to it and then dried into hard little balls. These balls are then re-hydrated as the base for the sauce used in mansaf. In San Jose, jameed is available, in a ready to use form, at the International Food Bazaar. There seems to be a split between how the Jordanian chefs make mansaf and how it is made by “home” cooks. The Jordanian chefs boil whole lambs directly in the jameed and water. They do not seem to add any other ingredients to the lamb. Home cooks appear to boil the lamb with aromatics and seasonings. They use some of the broth in making the rice, before adding the jameed during the final stages of the cooking time. Jan does not like boiled/braised lamb, so she asked me to make this a barbequed mansaf. After I braise the lamb until it is tender, I will marinate it overnight in the jameed. Finally, I will barbeque the lamb. The “proper” bread to use as the bottom layer of mansaf is markook or shrak. This thin bread is not readily available in San Jose, so I am using lavash. 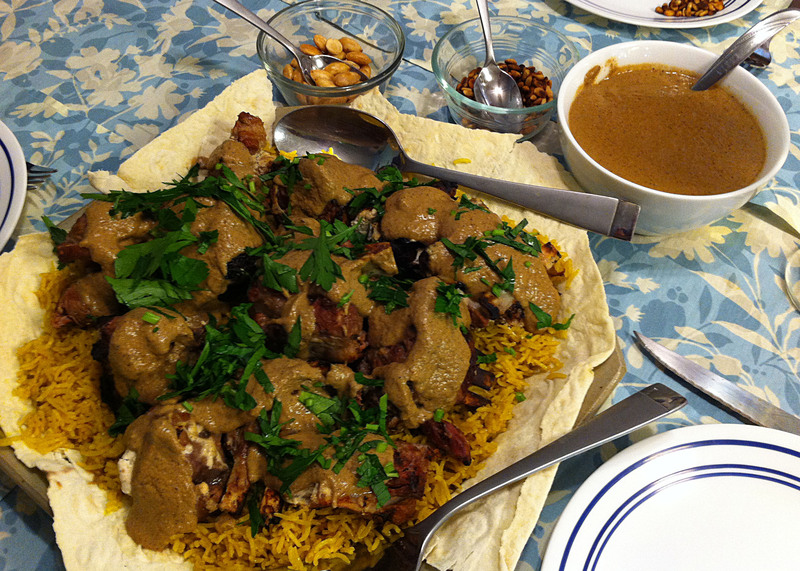 Traditionally, mansaf is presented with a layer of bread, topped by the rice and with the lamb arraigned on top. The jameed sauce is then poured over all and the dish is garnished with parsley and toasted nuts. It is then eaten with your fingers from the communal dish, making a ball of meat and rice that you then pop into your mouth. With my diners’ dietary restrictions, I will have to deconstruct this dish to meet their needs. Chris does not want a lot of starch, so I will not be making as much rice as a traditional cook would use. The jameed sauce will have a fair amount of fat from braising the lamb, so Jan will want me to serve it on the side. Finally, I have suddenly become allergic to tree nuts in the last month, so I will be serving the toasted almonds and pine nuts on the side. I will be serving Jordanian cauliflower as my side dish. We did not plan any dessert for this meal, but then we remembered that we had some medjool dates from Furnace Creek. Being Californians we had to stuff them with peanut butter. It was the perfect finish for this meal. After Dinner Note: This dish came out very well, but it was not what the kids had at Dishdash. Chris said that the sauce they had was much lighter. Probably it was closer to Jordanian chefs’ mansaf, jameed without any other spices. Tip: Have the butcher cut the lamb shoulder into large chunks (about two inches per side). Unless you have your own culinary band-saw, cutting the shoulder blade is not something you can do at home. 1. Bring a large pot of water to a boil. Rinse the lamb well and add it to the hot water. Tip: I am using a Dutch oven, because I prefer to braise meat in the oven. The oven has better heat control than you can get on a stove top. 2. Boil the lamb for 10 minutes, skimming as necessary. Tip: This hard boil sets the albumin over the entire surface of the meat and makes a coating through which the juices cannot escape. It also cleans away any surface impurities and bone chips from the butcher shop. 3. Discard the boiling liquid and rinse meat and the pot of any remaining scum. Tip: You may have noticed that I am not adding any salt to this dish. The jameed is heavily salted, so adding any more salt would be too much. 4. Replace the lamb in the pot and add just enough water to cover the meat. 5. Bring the pot to just to a boil. 6. Add the onions, celery, baharat and pepper, cover, and set the Dutch oven in a 300° F oven. Braise for one hour. Note: The addition of the baharat is what makes this a Bedouin dish, rather than Jordanian. 7. Remove two cups of the braising liquid and turn the meat pieces over. Tip: You will de-fat this broth and use it in making the rice for the dish. 8. Stir in 2 cups of re-hydrated jameed (1 package, ½ kg.). Recover the pot and return it to the oven. 9.Continue braising for one to two hours, until the meat is very tender, but not quite falling off the bones. 10. Remove and cool the meat slightly. 11. Mix one cup of the pot liquid with the second package of jameed. Tip: You want a very thick yogurt paste. 12. Put the meat and yogurt paste in a gallon plastic bag and marinate for four hours in the refrigerator. 13. Two hours before dinner rinse and put the rice in a pot of water to cover. Soak the rice for at least 30 minutes. 14. An hour and a half before dinner start the barbecue. Note: I am a traditionalist barbequer—briquettes, not gas. 15. Remove the meat from the refrigerator and let it come to room temperature. 16. Toast the almonds and pine nuts in a dry pan. Tip: Cook the nuts separately, as they do not toast at the same rate. Note: All of the Jordanian cooks insisted that it was an important to start with skin on almonds. They would blanch and peel the almonds before toasting. 17. Put the reserved pot liquid into a medium pot and simmer to thicken. 18. Drain the rice well. 19. In a medium pot with a tight lid, melt the ghee and add the rice. Stir the rice to coat it with the butter. 20. Add the turmeric, cardamom pods and stir in the two cups of reserved lamb broth. 21. Cover tightly and simmer for 20 minutes. 22. Check the rice for tenderness. If necessary add a bit more water and continue simmering for a few minutes more. 23. Remove the rice from the heat and leave covered to keep it warm. 24. Check the sauce for thickness and cover to keep it warm. Tip: The sauce should be fairly thick. 25. Barbeque the lamb directly over the coals until well browned on all sides. Tip: The meat is already fully cooked. You are only going for a good appearance and to re-warm the meat. 26. Lay a sheet of lavash over a large platter. Fluff the rice and spread it over the bread. Arrange the lamb pieces over the rice. Spoon a little bit of the sauce over the lamb and garnish with the parsley. Serve the jameed sauce and nuts on the side. Note: If you do not have the dietary restrictions I have, you would present the dish this way: Lay the bread on the platter. Spread some of the sauce over the bread. Spread the rice over the bread and spoon some of the sauce over the rice. Arrange the lamb pieces over the rice and spoon mre sauce over the lamb. Garnish with the parsley and toasted nuts. OMG, look what’s here, yummy! This is a super thoughful post. Thanks for all the outside links!